Medicine has been a part of Sharon since Dr. Simeon Smith arrived in 1758 with his focus on the controversial smallpox inoculation and on the professionalism of medical practitioners. Today, our various practitioners are collectively the largest employer in town, so the tradition continues. 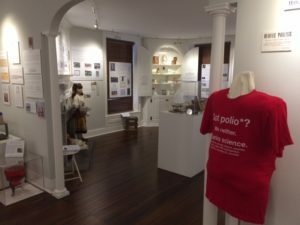 This exhibit, Sharon Cures, looks at three still-relevant 21st century medical controversies through the lens of time and local stories. Advancement in vaccination, immunotherapy and physician gender equality are evident throughout Sharon’s history. Two local doctors made significant national contributions: Simeon Smith to smallpox treatment and William Bradley Coley to cancer treatment. Another one, Josephine Evarts, left a deep and lasting imprint on the Northwest Corner with her woman’s perspective on patient care. Please enjoy, read, learn and share this information with your friends and family.